Microsoft’s Lumia 950 is the first interesting Windows phone to be released in a while, mostly because it’s the first phone designed specifically for Windows 10. 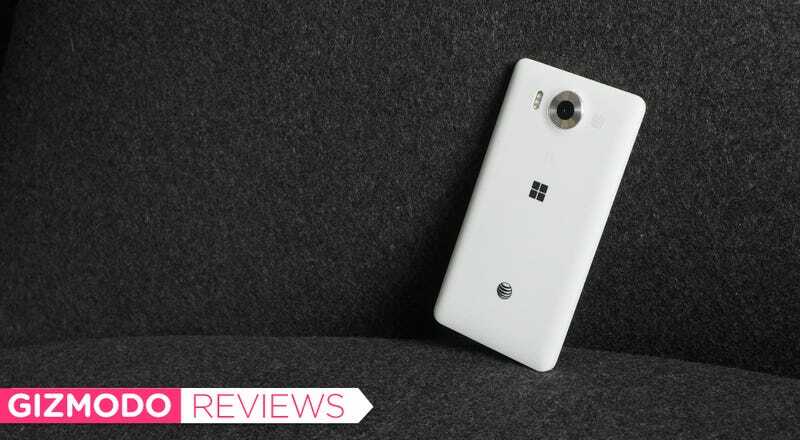 It’s a phone created with the ambition of turning around Microsoft’s flailing mobile efforts. At the very least, Microsoft has made a smartphone that’s usable. After forcing myself to use it for the past week, however, I’m not sure why anyone would want to. Along with its bigger XL cousin, the Lumia 950 is first in the line of phones designed for Windows 10. The handset packs solid smartphone specs behind a 5.2-inch screen, including a Snapdragon 808 processor and 32GB of storage. The 20 megapixel PureView camera is a direct descendant from the excellent Nokia cameras from the good ole days. The 950 costs $550 and is currently exclusive to AT&T, but you can buy an unlocked version at Microsoft. As I’ve already said, the Lumia 950 is a lot of firsts for Microsoft. It’s the first Windows 10 phone. It’s the first top-spec’d Windows phone developed since Microsoft acquired Nokia’s phone business. Further, Microsoft hopes it will be the first phone to convince consumers, and perhaps more importantly, developers, that they should bother thinking about Windows as a viable mobile platform. For all of its rabid fans, Windows has always been a very limited mobile operating system that few people would choose on its own. It has never had the apps or fluid user experience of Android or iOS. Theoretically, you could use a Windows phone to do the basics, but you sacrifice a lot by going with Microsoft. I know only person who voluntarily uses Windows as a phone. That said, Windows phones have their attractive features. Nokia’s handsets were beautiful. For the clumsiness of the tiled design, Windows Phone 8 did have a striking appearance even if it wasn’t exactly easy to use. And it did have one of the best cameras, developed by Nokia, in hopes that people might buy into an inferior operating system for better snapshots. With Windows 10, Microsoft wants to entice users with a platform that offers a seamless desktop-to-mobile experience. The same Windows apps that work on your desktop work on your phone as well. You get the same Cortana assistant, and you can even plug your phone into a monitor and use it as a desktop—kind of. This is an intriguing idea! Windows 10 is very good operating system that fixes many of the screwups that Microsoft made with Windows 8. But the real key is whether Microsoft can manage the mobile-desktop convergence. Everyone seems to agree that this is the future, but no one has pulled it off. Microsoft would be the first, and it would be a formidable success. I’ll say this much about the 950: People are curious about it. I tested the matte white version, and it definitely caught attention in the way you’d hope a $550 investment would. But when I handed it over to an inquiring observer, no one ever concluded that this was the phone for them. The 950 is supposed to be the next era in Nokia’s long line of beautiful phones, and frankly, you wouldn’t know much of its design pedigree by staring at this minimal block in front of you. The Nokia phones back in the day, like the 1520 or the 1020 were loud and attractive. They were bold design statements. The 950 doesn’t say anything at all. The 950’s shape is best described as “boxy,” and the plastic removable back succeeds in both looking and feeling cheap. (At least you can replace the battery!). The phone’s lone striking characteristic is the silver ring around the camera lens, which pops out of the matte plastic back like a robot eye—the one design feature I actually like. I spent an entire week using the Lumia 950 trying to do everything that I would usually do on a phone. For the most part, you can use this thing as your primary smartphone almost worry-free. In the past, I found Windows Phone so limited compared to the competition that I would get easily frustrated, and to its credit, Microsoft has streamlined settings and notifications to the point that I don’t have a daily urge to throw the Lumia 950 against the wall. That said, the phone does bring its frustrations, and I might as well just get this out of the way right now: Windows 10 isn’t a great mobile operating system yet. It’s quirky and buggy. Apps crash more frequently than on other platforms, and they’re frequently slow to load. On battery life, the phone barely makes it through a day, and will need a charge if you’re using it a lot. That said, let’s get our hands a little more dirty. A big part of Microsoft’s effort to make Windows a more appealing platform is universal apps, which means that all apps built for Windows 10 will work regardless of whether you’re on a phone, tablet, or full-blown computer. It’s a smart move in terms of attracting developers. Still, with Windows 10 being only a few months old, there aren’t many universal apps to choose from. For now, there are options for some of the platform agnostic services people use most, like Spotify, Twitter, Netflix, and Fitbit. There are even beta versions of apps like Slack and Instagram. Windows hasn’t caught up on some of the most popular apps on other platforms, and probably never will. Don’t expect to see Google apps on Windows any time soon. But if you buy a phone for the basics—maps, messaging, and phone calls—then this phone will do you just fine. One of the billboard features of the mobile version of Windows 10 is Continuum, which is a fancy way of saying that you can plug you phone into monitor and use it like a low-powered desktop. You can use Continuum entirely wirelessly—with the help of a third-party dongle—or with a little $99 Microsoft-produced brick called the Display Dock. Despite the wires, I found the latter more practical. This early version of Continuum is indicative of a wonderful future we might one day live in, where our phones are the brains for all of the screens we use. It’s a beautiful fantasy, but we’re not there yet. The most surprising thing about Windows 10 on a phone is how much it feels like Windows Phone 8 for the most part. There are touches here and there that remind you it’s not Windows 8, and perhaps the most notable improvement involves Cortana, the new Windows productivity assistant. I’ve always been skeptical of how useful assistants can really be. That said, Cortana is functional and relatively proactive in the way you want it to be. It knows my package tracking numbers, for example. Occasionally, Cortana will flash me other relevant information, but other I’m never left feeling like I can’t live without it. When Nokia launched its PureView-loaded smartphone cameras, it changed the the baseline of what you could rationally expect from photos captured by your phone. So it’s no surprise that the 950 takes very good photos. They’re sharp, and you usually get the shot you want on the first try. In the event that you want to tinker with your settings, it’s totally possible because the camera app gives you access to full camera controls, just like those you would see on a fancy shooter. The camera suffers from many of the performance foibles you experience across the phone. The hardware camera button on the side of the phone doesn’t always work and when it does, the app is slow to actually start up. Generally, the app isn’t as snappy as you’d like it to be. That’s too bad because otherwise it’s a robust camera. Windows 10 is an attractively designed operating system. You can do almost everything you want to, and the platform even has a good camera. Cheap feeling hardware. Buggy performance. There aren’t enough universal apps yet. No, unless there is some crazy reason that you need to have a Microsoft Windows phone. Though the 950 is an important first step toward making Windows an attractive option for developers, that promise hasn’t been delivered on the smartphone side of things. There’s just no reason to choose a pricey Windows handset when Google and Apple offer way better options. When I am done with this review, I will remove the SIM card from the Lumia 950 and put it back into a Nexus 6P. Big things might be happening for Windows, but the platform’s biggest ideas still don’t fit into your hand.